Pyramids might also be particularly well-suited for use as . study booths in high schools and institutions of higher education. If, as claimed, the pyramid is capable of both relaxing and energizing individuals, many students might find their mental acuity vastly improved by doing their research or homework inside such structures. If, as mystics claim, the pyramid tent does induce an altered state of consciousness, individuals learning to control their own brain waves through the application of bio-feedback techniques might be aided considerably if their training were to be conducted inside these tents. Ostrander and Schroeder quote Karl Drbal as saying, “Some researchers believe if hospitals were built in [the pyramid] form, patients would get better faster. . . .” Other medical personnel are beginning to wonder if pyramid tents might not be used as an aid to the natural healing process. Pyramidologists suggest that certain spots inside the pyramid have a “vibrational level” corresponding to certain physiological organs. Consequently, sitting in one spot in the pyramid tent might be of great benefit to a heart patient, whereas sitting in an entirely different position might facilitate the healing process of a person recovering from a kidney infection. Some people have even gone so far as to speculate that childbirth might be facilitated inside a pyramid. Pyramid containers have been suggested for storage of drugs. Such storage could add months, or even years to the shelf-life of the pharmaceuticals. Considering that the relaxing effects of the pyramid have been so highly touted, it is not surprising that some people are claiming that pyramid-therapy will be the newest form of psycho-therapy. On a more prosaic level, pyramids might be used inside our homes as cupboards or canisters which would help to preserve grains, dried fruits, nuts and perhaps even produce. 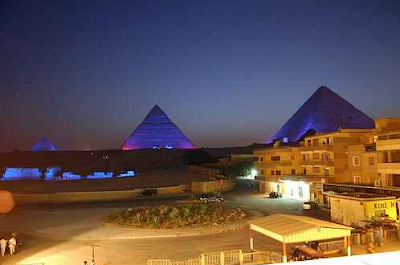 It is even possible that the day will come when entire supermarkets will be constructed in the pyramid shape. Or perhaps the cereal and dry food sections might be built in pyramid form. Carrying this suggestion one step further, perhaps grain storage elevators could be constructed in pyramid form. If these could preserve grains longer than the present structures can, they would certainly be useful in a world in which the population is expanding and food shortage could become a serious problem. As we have already mentioned, many people have discovered the relaxing effects of the pyramid-tents. But one tent user has come up with a new twist. This California businessman claims that the tent not only gives him a spiritual lift, but improves his sexual desires. This does not come as a surprise to some occultists, who claim that certain parts of the pyramid correspond to parts of the human body; carrying this one step further, they claim that specific parts of the anatomy correlate to certain chambers in the Great Pyramid. Thus, the unfinished chamber, often called the grotto, corresponds to the sexual organs, the King’s Chamber corresponds to the mind and the Queen’s Chamber to the heart. It will be interesting to follow, throughout the next few years, the progress made by amateur and professional researchers in the new field of pyramid- ology. We look forward to seeing the uses of the miniature pyramid expand, and to learning of the construction of new pyramid-shaped buildings.